PESHAWAR, Pakistan, Jun 23 2014 (IPS) - Shaukat Ali, a shopkeeper originally hailing from Miramshah in the Northern Waziristan Agency of Pakistan’s Federally Administered Tribal Areas (FATA), looks exhausted as he sits outside a makeshift shelter with his family of 10. They traveled for a whole day to reach this tiny house outside of Peshawar, capital of the Khyber Pakhtunkhwa (KP) province that borders Afghanistan, and now count themselves among the thousands of civilian refugees fleeing a full-scale military offensive aimed at rooting out terrorist groups from Pakistan’s mountainous regions. He tells IPS that the situation back in Waziristan, a Taliban stronghold, is “pathetic”, as scores of families abandon their homes and all their possessions to escape the Pakistan army’s airstrikes, which have resulted in food shortages and widespread panic since they began in earnest on Jun. 15. “We traveled on foot for five hours just to hire a vehicle that would bring us to Peshawar, and from there we traveled even further to reach Bannu [an ancient city in KP],” the distraught man continued. “Three of my five sons developed temperatures along the way and we don’t have money to consult doctors or purchase medicines,” Ali said. It is likely that all the other 100,000 displaced people now living in 65,000 government-sponsored tents in KP are experiencing similar hardships, with several people clamouring to share their own stories of escape. Some say they left Waziristan on tractor-trolleys with nothing but the clothes on their backs; others loaded small bundles onto donkey-driven carts but left behind all but the most basic items for fear of overburdening the beasts. Many left in such a hurry they were separated from their family members. Zainab Khatoon, a horsewoman from Waziristan, arrived in Bannu with two of her children but has no idea of the whereabouts of her husband and elder son. “As soon as the government-imposed curfew was relaxed, we left for Bannu,” the 42-year-old woman recounted to IPS. “My husband and son stayed behind to collect rations like biscuits, rice, tea and oil from our local shop. Three days have passed and they have still not arrived,” she lamented. Several others told IPS they too have lost loved ones in the chaos. “We are extremely concerned about people’s missing relatives,” Jawad Ahmed, a camp official, confided to IPS, adding that many of those who arrive are afraid to register their presence with officials for fear of violating the Taliban’s ban on seeking government assistance. By Sunday, the total number of displaced persons had reached 394,000, with many refugees thought to have crossed the border into neighbouring Afghanistan due to a lack of “electricity, water, food and medical supplies” in KP, Muhammad Rahim, an official with the National Disaster Management Authority, told IPS. Besides Bannu, the most popular destinations in KP appear to be Lakki Marwat, Tank, Karak and Hangu. “KP has so far received over 7,000 families, or close to 100,000 people,” an official named Sajjid Khan told IPS, adding that some families are making their way towards the southern cities of Lahore and Karachi. In anticipation of an extended military campaign, the government has allocated one billion dollars to relief for the displaced population, which will go towards erecting shelters, toilets and possibly even schools for the youth. Shoaib Sultan, a political analyst at the University of Peshawar, believes the operation is unlikely to end in the immediate future and people are destined to witness hard times. “The scorching heat, with a temperature of 45 degrees Celsius, has multiplied the woes of the people, many of whom are simply taking shelter under trees on roadsides,” he told IPS. Codenamed Zarb-e-Asb (meaning the sword of Prophet Muhammad strikes), the army operation is in part a response to the insurgent attack on Karachi international airport earlier this month, which killed 18 people. While many welcome the government’s hard-line approach to persistent terrorism, it appears that impoverished residents are bearing the brunt of attacks, as they have for nearly a decade. Some politicians, like Imran Khan of the Pakistan Tehreek-e Insaf (Pakistan Movement for Justice), have called on the government to suspend the operation until residents can be safely evacuated. Since 2005, the military has made sporadic efforts to wipe out insurgents from the border regions, where the mountainous terrain provided a convenient base for Taliban members fleeing U.S. troops in Afghanistan. Caught between the army and the militants, civilians were forced to leave the tribal regions altogether. A mass exodus that has continued more or less uninterrupted for nearly nine years has already seen 2.1 million people flee their homes in FATA, only to descend on the neighbouring province of KP, where officials have struggled to meet their needs. Many have lived in wretched conditions for years, with little access to food, water and proper sanitation, in mud huts or camps. Dr. Fayaz Ali, a public health expert, is worried about what the latest refugee wave means for Pakistan’s ability to achieve the Millennium Development Goals (MDGs) – a set of poverty reduction targets agreed upon by the United Nations, which includes lessening the number of slum-dwellers by 100 million by 2015. “Those who have been uprooted by the conflict have no choice but to live in congested conditions,” Ali told IPS. Prior to the latest influx of refugees, Bannu was playing host to 50,000 displaced families. Estate dealers here say the demand for houses was already skyrocketing, as people jostled for the few available residential units, while those unable to afford formal housing occupied mud huts. Officials say there is literally no room to house the incoming refugees, who are for the time being occupying government schools in order to minimise the spread of diseases in overcrowded camps. “We are treating the displaced people for food- and water-borne ailments,” said Rehmat Shar, a Bannu-based doctor. “We have seen about 650 patients, which included 200 women and 300 children. Most of the patients required rehydration due to the unrelenting heat,” Shah, who works in the district headquarters hospital, informed IPS. 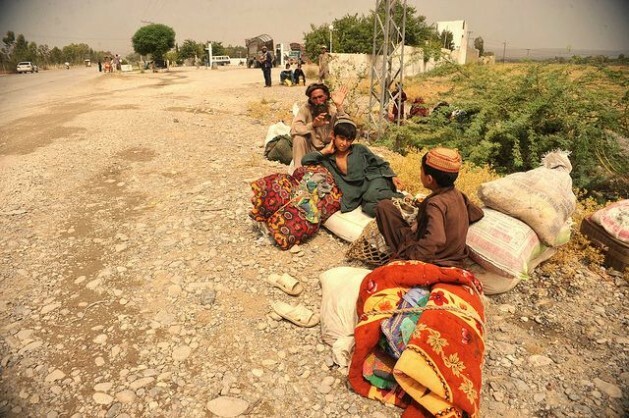 “The living conditions are miserable,” added Wahidullah Khan, a former resident of the Mir Ali town in North Waziristan who rushed his family of eight to Bannu as soon as the army launched its operation. He and his wife say they left everything behind when they escaped and are now figuring out how to start their lives from scratch.